The Clorox Company (CLX) manufactures and markets consumer and professional products worldwide. It operates in four segments - Cleaning, Household, Lifestyle and International. This dividend aristocrat has paid dividends since 1968 and has increased them each year since 1977. Last month, Clorox hiked its dividend by 14% to 96 cents/share. This was an accelerated declaration of the company's dividend increase, which typically takes place in the month of May. Over the past decade this dividend growth stock has delivered an annualized total return of 11.70% to its shareholders. The company has managed to deliver a 5.20% average increase in annual EPS over the past decade. Clorox is expected to earn $6.13 per share in 2018 and $6.51 per share in 2019. In comparison, the company earned $5.35/share in 2017. In addition, between 2008 and 2017, the number of shares decreased from 142 million to 132 million. Clorox has a portfolio of products with strong brand names, that are number one or two in their respective product lines, which helps in having pricing power. As a result, it should be able to pass on commodity price increases to customers. Future earnings growth could be driven by innovation, new product launches, cost containment initiatives, as well as international expansion. The three pillars of the strategy include expansion in a geographic, category and channel direction, continued reinvestment in its brands as well as cost containment initiatives. A key driver of the strategy is to accelerate sales by growing existing brands, including expanding into adjacent categories, entering new sales channels and increasing penetration within existing countries. Increased exposure to emerging market economies could further drive increase in sales. The company also anticipates using its strong cash flow to pursue growth opportunities and increase shareholder returns. In addition to that the company will be targeting sales growth through product innovation, which helps its pricing power. Clorox will also target margin expansion and maximizing cash flow through implementation a continued robust cost-saving program and maintaining price increases the company has taken. The strong focus on cost, has provided the company with a relative cost advantage versus competition. In addition, Clorox continuously reinvests money in its brands, which helps it maintain its market position. One of the risks behind Clorox is that it generates a large portion of revenues from the US – over 80%. It is more exposed to the US economy than other global consumer staples companies, which could also be an opportunity as well. 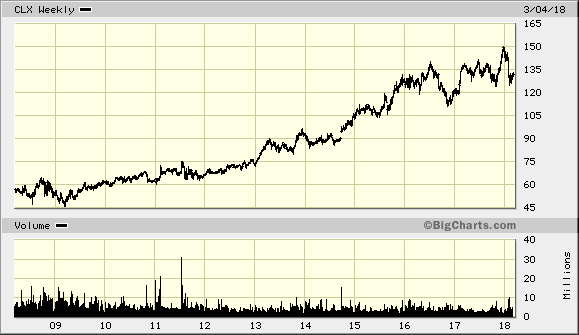 The other risk I see is that Wal-Mart (WMT) accounts for a quarter of sales for Clorox. Wal-Mart is notorious for trying to keep costs low, by squeezing vendors to sell at lower prices. This is bad for pricing power, and could impact profitability. This over reliance on Wal-Mart could be mitigated through continued international expansion. The other risk include competition from generic products, which could be mitigated by the ability to distinguish Clorox' brands by spending on R&D and advertising. 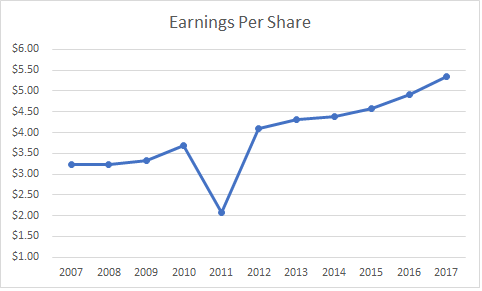 The annual dividend payment has increased by 8% per year over the past decade, which is higher than the growth in EPS. This was accomplished through the expansion of the dividend payout ratio. Future growth will be limited by any growth in earnings per share. 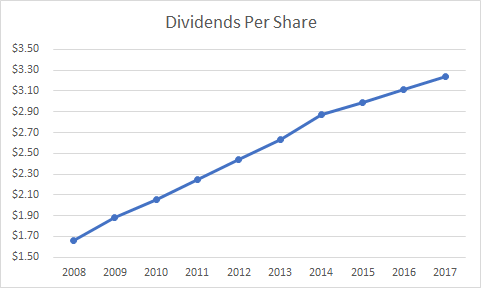 The five year growth in annual dividends of 5.80% is closer to what we can reasonably expect going forward from Clorox in terms of future dividend growth. 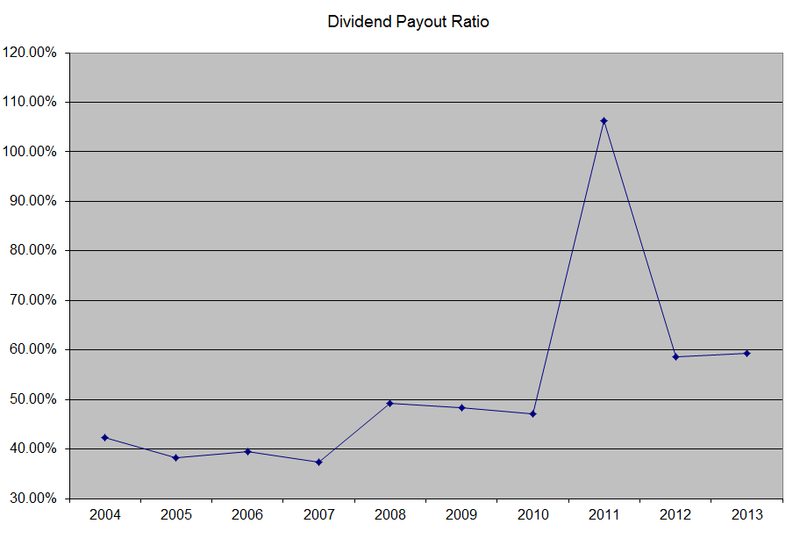 An 8% growth in distributions translates into the dividend payment doubling every nine years on average. Since 1986, Clorox has been able to double dividends almost every seven years on average. The dividend payout ratio increased from 51% in 2008 to almost 60.60% in 2017. A lower payout is always a plus, since it leaves room for consistent dividend growth minimizing the impact of short-term fluctuations in earnings. The company’s Return on Assets has decreased slightly over the past decade. Rather than focus on absolute values for this indicator, I generally want to see at least a stable return over time. Currently, the stock is slightly overvalued at 21.20 times forward earnings. The stock yields 2.90% today. I am analyzing the company because I believe it is quality dividend growth stock, which may be worth a second look on dips below $122/share. This is equivalent to a forward P/E below 20. For more conservative investors, they may want to wait for 20 times FY 2017 earnings, which is the equivalent of buy the dip below $107/share.